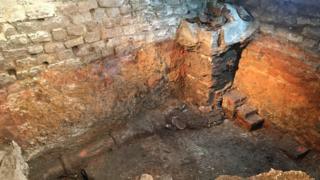 Archaeologists have begun re-excavating a hidden Roman bath which was first discovered 130 years ago. After its discovery, the site in Bath was excavated and then backfilled, with only limited records about its structure being kept. It is one of eight baths known as the Roman Baths and is beneath York Street next to the main suite. The work is taking place before the conversion of nearby former Victorian spa buildings. Stephen Clews, manager of the Roman Baths, said: "The excavation of this bath is part of the most significant archaeological investigations to have taken place at the Roman Baths for more than 30 years. "It is helping us to build a picture of what was happening on the south side of the site, where it has been very difficult to gain access in the past." Excavation is taking place before the Archway Project, which will provide new surroundings for visitors to the Roman Baths. The scheme - carried out by Bath and North East Somerset Council - will also create a new World Heritage Centre for the city which is due to open this year. The excavation is likely to finish in May.